This 63-page study, supported by the Bank Insurance & Securities Association (BISA), has been conducted biannually since 1993. It addresses compensation issues relating to managers and salespeople in retail bank investment programs, focusing particularly on annuities, mutual funds, life insurance, and fee-based products. What are the compensation levels of program managers? Do they vary significantly based on the size of the institution, the breadth of manager’s responsibilities, or the amount of program revenues generated? From where are dedicated salespeople recruited? Wirehouses? Other bank brokerage programs? How much of their compensation is in the form of commission? H ow much salary? What is the typical sales specialist earning each year? The top performers? How many sales managers do institutions typically employ? What are they paid? What percentage of their compensation is commission? How much incentive compensation is paid to platform personnel who sell investment products? 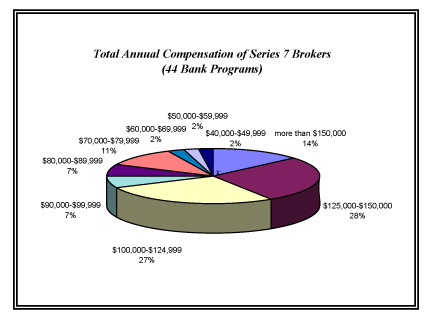 What order of profits does the typical dedicated rep earn for his or her bank? Eight were "very large" institutions (with more than $15 billion in retail deposits). Fourteen were "large" institutions (with $5 billion to $15 billion in retail deposits). Sixteen were "medium" size institutions (with $1.5 billion to $4.99 billion in retail deposits). Nine were "small" institutions (with less than $1.5 billion in retail deposits). 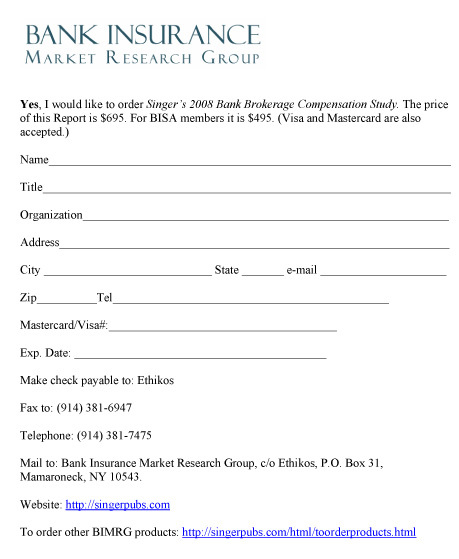 BISA members enjoy steep discounts when ordering the study, which was available for shipment in August 2008.